FANBOY PLANET.com . : Shaun the Sheep :. Inoffensive, simply plotted, and with a heartwarming message for families -- it seems more like it should just be on television in a programming block for young children. And Aardman Studios' Shaun the Sheep has spent some time being just that. Yet like a sheep going over the fence, it makes a graceful leap into theaters just fine, though it's hard to imagine the 10 p.m. showings being rather crowded. Film fans might be missing out, though, if they ignore it. It's pretty rare when a studio manages to mix modern sensibilities with classic silent film comedy, and though there are sounds and songs, Shaun the Sheep focuses on the visual, making it charming in any language. The film gives a quick background on the main characters in a charming montage that shows Shaun growing up with his dog friend Bitzer under the loving eye of the Farmer. But even bucolic life on the farm gets to be a bore, despite the rooster's best efforts to vary his routine in waking everyone up. Shaun dreams of a day off from waking up, going to the meadow, eating, getting shorn, etc. He wants a day in the house. At first his clever plan seems to be working, until a duck sells out the sheep. And then the pigs get in the way... don't they always? 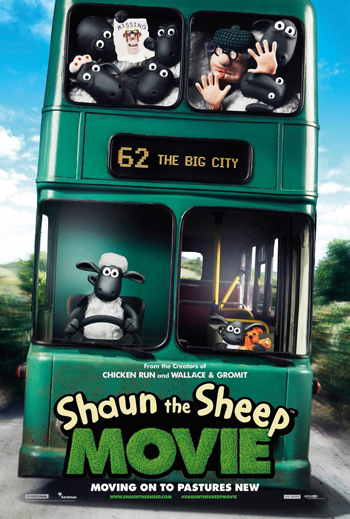 Through a series of little things going wrong, the Farmer ends up lost in the Big City with no memory, and Shaun must lead the rest of the sheep in trying to rescue him. It's that simple, and that focused. Every misadventure rolls neatly into the next, and even when Shaun gets embarrassed by his fellow sheep's behavior, the story always emphasizes the importance of family. Occasionally it makes little satrical jabs at culture, but nothing mean-spirited. No plot detail gets thrown away, and each subpolot wraps up neatly. It's worth pointing out only because more effort seems to be made in this children's film to make sense than in most of the live-action comedies this summer. It's cute, it's simple, it's fun. I'd like to think the masters of silent film comedy would be proud.